I know people who profess to not like sweets (although I'm not sure I believe them). These are folks who would rather nibble on corn chips than a chocolate bar, and can't be tempted by a plateful of iced sugar cookies. If you are among these mythical beings, this week's cracker recipe is for you. These simple-to-make crackers are rich and buttery, yet light, with a savory tang from cheddar cheese and sun-dried tomatoes, and a warm bite from cayenne. They puff up while they bake and become flaky and gently crisp. Cut small, homemade cheddar crackers are the perfect party appetizer, but you don't need to wait for a special occasion to serve them. You can pair a couple of these delicious crackers with a simple bowl of soup for a satisfying cold-weather lunch, serve them alongside chile, or snack on them anytime you don't feel like something sweet. 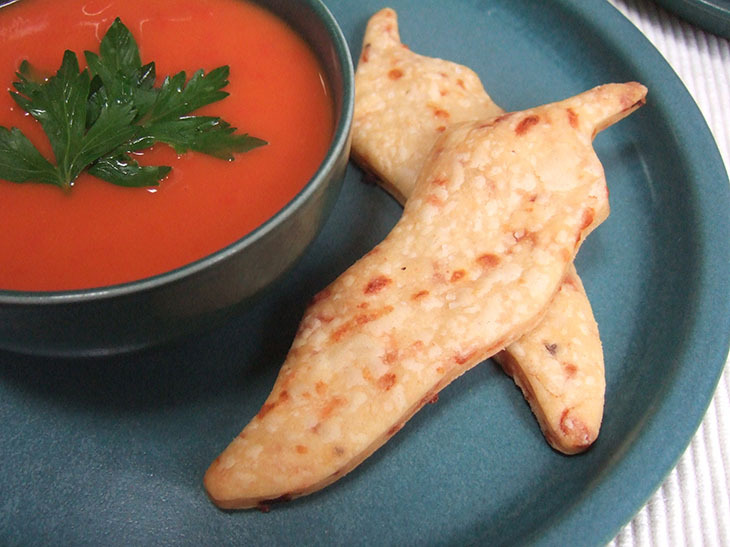 My favorite shape for Cheddar Crackers include the Chili Pepper cookie cutter, the Duck cookie cutter, and the Fish cookie cutter.